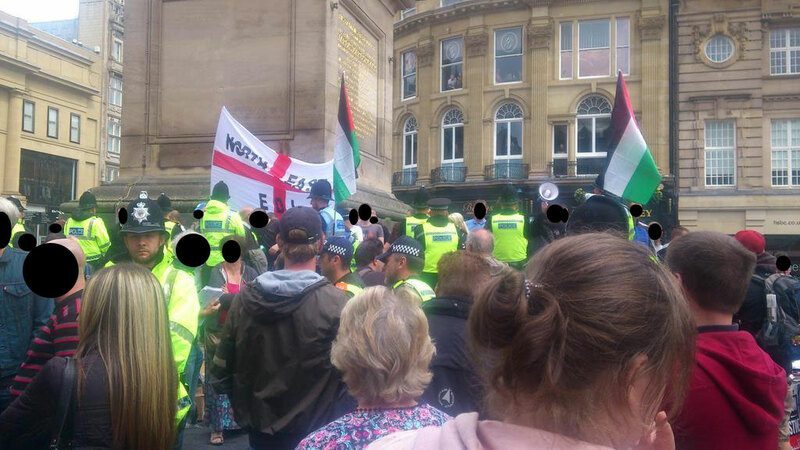 As many readers are no doubt aware, since the beginning of the current Gaza crisis on July 8th, the EDL and other far-right fascist groups have been popping their heads up and attacking and abusing pro-Palestine demonstrations. They have always been vastly outnumbered by demonstrators against Israeli apartheid but as this list shows, they have been active and persistent across the country and have resorted to acts of violence and harassment against individual protestors when they have been able to get away with it. The demonstrations, marches, vigils and so forth that have taken place in connection with Gaza over the last month have been almost uniformly peaceful despite people’s understandable anger and have represented a cross-section of the community with people of all ages including lots of children. Obviously the EDL and their fascist chums count it a great victory to chant racist abuse and intimidate and attack peaceful family-friendly demonstrations including small children. Anti-fascists should not allow them to claim these victories. Ideally we should be aiming to know when they are planning these mobilisations and to see them off. The traditional role of the far-right is as the boot boys of the most reactionary elements of the establishment and there is a long and shameful history of them performing exactly the same role they are adopting here in regard to the Gaza demonstrations with anti-Apartheid demonstrators or protestors against British troops in Northern Ireland in the 1970s and 1980s. 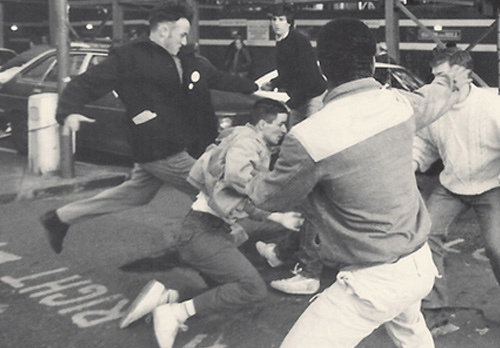 A t this time anti-fascists often adopted the role of keeping their eyes open for fascists lurking trying to pick off people from demonstrations against South Africa or the British military presence in Northern Ireland. Then as now of course, the fascists are on the wrong side of history, but in the meantime they are a small but real menace that needs to be addressed. Part of the purpose of active anti-fascists is to defend the ‘space’ (physical and metaphorical) for the left, anti-racists and progressive causes to mobilise free from harassment from fascists – to keep that space open and not allow it to be closed down by the far-right through intimidation. As can be seen from this list, the North East seems to be a bit of a hotbed for fascists harassing pro-Gaza demos, but unfortunately they get everywhere, from Lincoln to Southampton. In many of the cases listed below it is obvious that many of the small EDL contingents have travelled relatively large distances to be there. This underlines their weakness – that they need to mobilise from across a large area to get 15 people out. But it also unfortunately shows their commitment to their deluded ‘cause’ – they are willing to travel across half the country to be outnumbered 10 to 1, and then do it again the next week. The far-right obviously has the capacity to mobilise people in multiple places at same time across the country for this sort of thing but only in small numbers. At most of the pro-Palestine demonstrations across the country we have seen no opposition from organised Zionists. However, in Manchester we are seeing more of an alliance developing between Zionists and local EDL and NF members around opposition to those calling for a boycott of the Kedem shop, which sources products from Israeli settlements. This, of course, is not massively surprising – the EDL has from the outset attempted, despite some of its own anti-semitic supporters, to be pro-Israel. Once there was an EDL Jewish division that seemed mostly to consists of Roberta Moore and the official name of the organisation for legal purposes is the ‘English and Jewish Defence League Ltd’. It’s rather more surprising that the pro-Israeli demonstrators are willing to tolerate their new fascist buddies, but obviously the threat of human rights activists applying international law is enough to see off the last of their scruples. In most of these incidents listed below nothing much has happened bar a bit of unpleasant racist chanting and shouting. But there are a couple of notable times when pro-Gaza demos have been physically attacked. More common than this is EDL members picking on people as they are caught unawares, often leaving the demo. 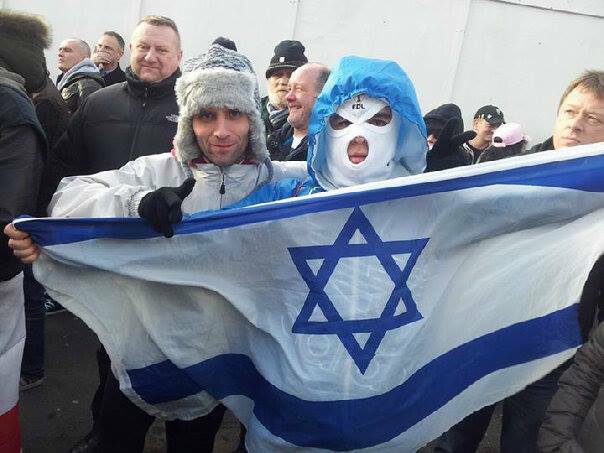 It is obviously important that people keep demonstrating and taking to the streets in opposition to the actions of the Israeli state, but without being frightened or put off we should be aware that at any similar events in the future there is a potential risk from these idiots. Unfortunately the EDL have not gone away and may even be seeing something of a resurgence. They have got demos lined up every fortnight and recently got 300-400 out in Batley, which was their best showing for a while. This is in the absence of any obvious factor helping them – none of the Islamist attacks they hope for to give them that ‘bounce’. Indeed they seem to metamorphosing into more of an all-purpose racist group. Their recent demo in Hexthorpe was against Romanian and Bulgarian immigrants, which clearly has zero to do with Islamic extremism even in the most fevered imagination. This may also be the calm before the storm of next year’s general election, when we can confidently expect the news agenda to be dominated by UKIP’s xenophobia and all the mainstream parties short-sightedly competing to out-do them at their own game. This will provide fertile ground for the far-right generally, which if we are unlucky, they may be able to overcome their own ineptitude long enough to exploit. Anti-fascist organisation is as necessary as ever. NB – For a good analysis from an AFN group on the role of the EDL in attacking pro-Gaza demonstrators see Portsmouth Anti-Fascists. 20 EDL heckle and abuse a pro-Palestine demonstration. This included some local EDL but also members from Kent and elsewhere. They harassed the marchers with obscene language and offensive comments as the names of the children killed in Gaza were read out. Due to their presence, although small, they managed to get the route of the Gaza demo re-routed, changed and cut short. EDL Regional Organiser Alan Spence (he of “send the black cunts home”) boasts about spraying deodorant in pro-Palestine activists’ faces after 20 of the fascists turn up to disrupt a pro-Palestine march. 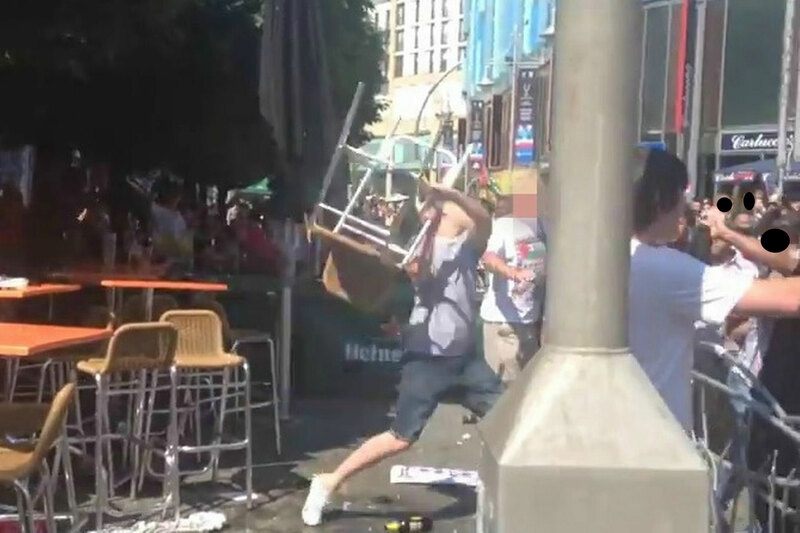 The most serious incident so far has been in Cardiff when a Gaza demonstration was twice violently attacked by men chanting racist abuse and throwing pint glasses, chairs and tables. 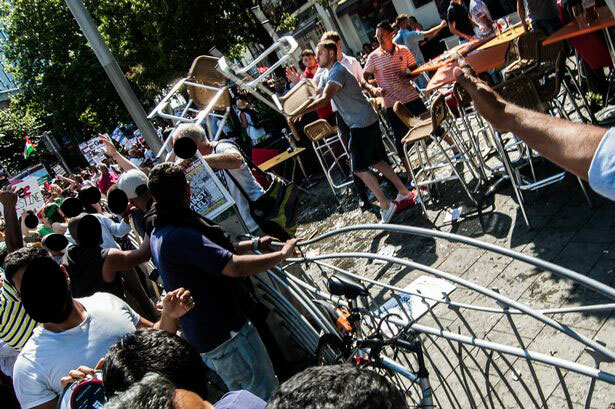 As the march passed pubs in two separate locations it was attacked. Pro-Palestine activists fought back and defended themselves but the march contained children and babies in pushchairs and people obviously were not expecting or prepared for any trouble. These attackers were not identified by any organisational ‘colours’ but the suspicion is that they were far-right or fascists of some form. 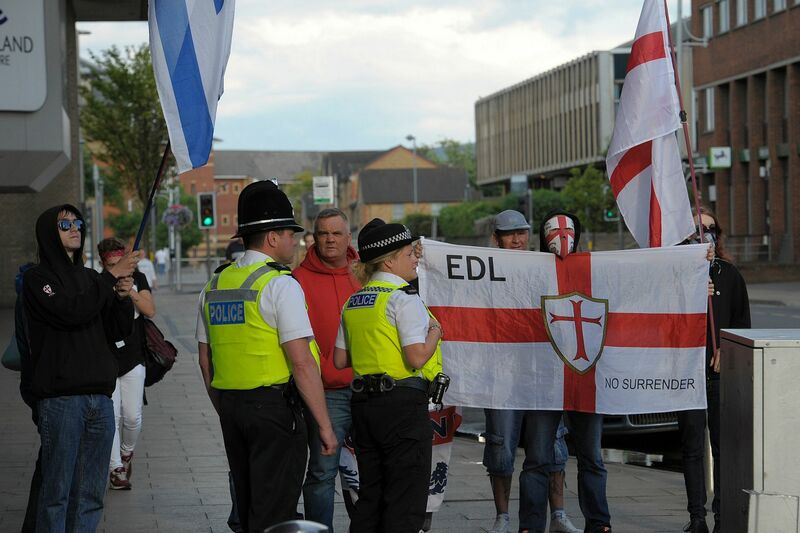 A whole 6 members of the EDL turn up in Lincoln to oppose a pro-Gaza demo in the city centre. A dozen EDL turn out in Wakefield to harass the Gaza demonstration there. 15 EDL members with English and Israeli flags attempt to harass 100 pro-Palestine activists saying they want to ‘disrupt’ the peaceful vigil. The incident prompted this inspired response from Teesside Palestine Solidarity activists. About 15 EDL attempt to disrupt a Gaza demo in Portsmouth, including roughing up two female demonstrators who told them where to go. Later after being chased off by pro-Palestine demonstrators they hassled another group of three women when they were leaving the demo, grabbing their trade union banner. 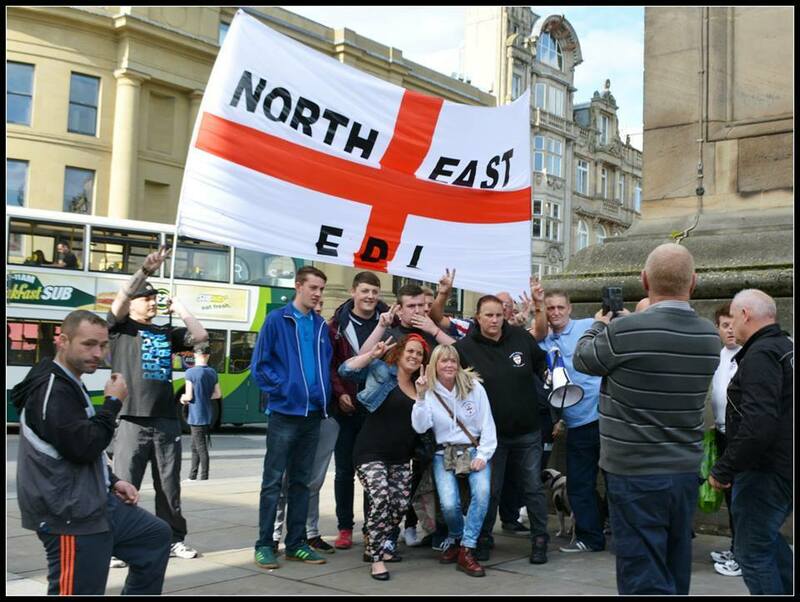 10 EDL and NF show up at a vigil to remember the dead of the conflict. The EDL turn up again to disrupt the Gaza demo. They have reportedly been coming to the Boro Gaza demo every week to heckle and disrupt it. EDL turn up to disrupt a Gaza demo and manage to get themselves arrested. 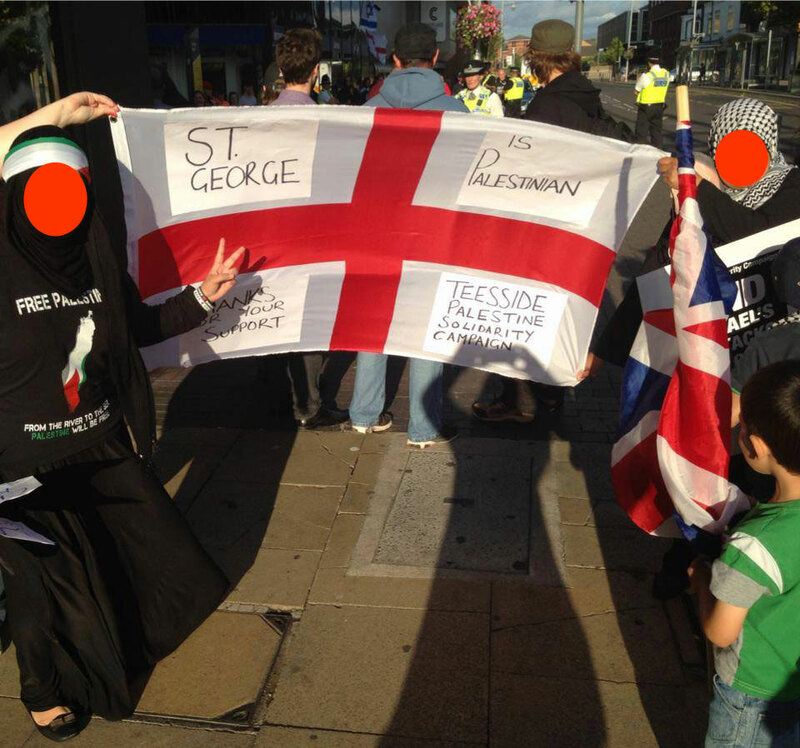 Reportedly 3 EDL show up to disrupt Gaza protest and some throwing punches followed. If you have any more information to add to this list please leave comments below. Thanks. NB – Apologies for the pictures of horrible fascists. We don’t normally do this, but it seemed important in this instance.